I have a hyperactive imagination. So it makes sense that I would think I’ve dreamt of my past life before. Because I’m crazy. That is the only logical explanation. I’m crazy. …holding out and fighting off death waiting for my husband to return. He was away and I wanted to see him one last time. He was an absentee kind of man. Never home, not because it was a loveless marriage–in fact, far from that. But rather, he was a merchant of some sort, had something to do with ships. I recall incessantly asking this fellow whether the message (?) was sent to my husband, the fellow repeatedly assuring me it was, and me being impatient about it all. There was some sort of note or message I was determined to get to him. That’s what I recall. I died not having seen the so-called hubby one last time, as was my wish. However, everything else could not have been more perfect. I clearly lived privileged and I must have been a decent human being because the people around me all seemed to be genuine and sincere with their affections. So okay, that isn’t exactly drawn to scale, but you get the idea. 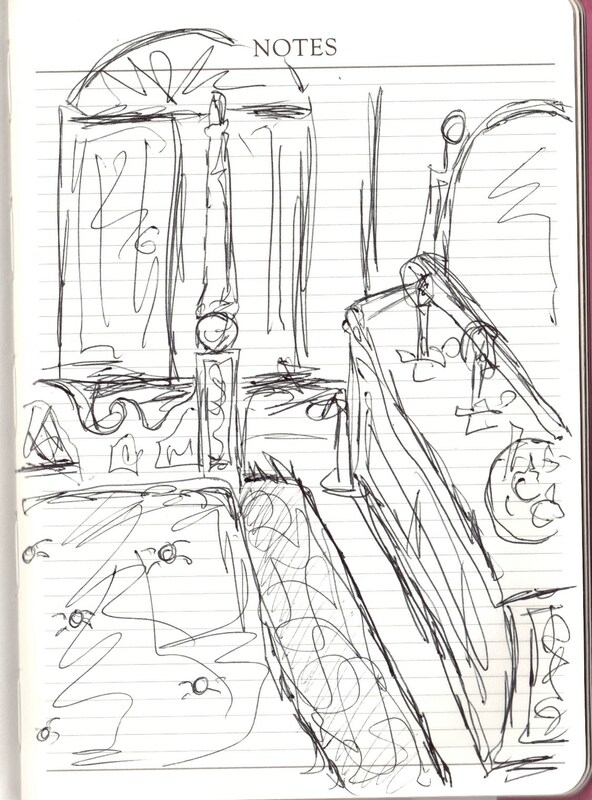 For instance, there’s more space than that between the bed and the dresser, but my sketching ability is shoddy. Give or take, I believe that to be what I saw a lot, from “my” perspective in this surreal-life-that’s-purportedly-mine. It was a beautiful, large, comfy bed with these long, high wooden bedposts. I cannot recall whether there was a canopy, but the bedposts were detailed and ornate. There was a rug. There was that dresser as I’ve (horribly) sketched out. Illumination of the room came from candles or lamps — actual flames, that is — sitting on the dresser. There was the entrance way, just off to one corner beyond the foot of the bed. I recall moments alone in that room, standing in front of that dresser in that ankle-length shapeless cream nightgown, looking at my reflection, missing my husband, holding the lamp/flame things. That is where I passed. In this lifetime (me, now), I’ve constantly wondered whether that husband fellow rushed home as fast as he could, dashed in only to find out he was too late, and what he might have thought. The whole thought, this scene as I’ve explained here, causes intense emotion in me, which I can’t rationally explain. Why would such an imagined scenario cause me to well up even now as I type this? I am about as far and detached from such a scene as one could possibly be and yet I feel so close and connected to it. To this day, I can sketch that above picture from my mind anywhere at any time. It’s always the same sketch, that same corner of the bedroom, just like that. I guess the “me” in this crazy scenario was very sickly and often bedridden. Fast forward to the summer after college graduation. I met a guy named J for the first time and we connected immediately. That past-life-deathbed-missing-husband imagination was from 3rd grade and 7th grade respectively. Then I became a full-blown superficial materialistic teenager and stopped thinking about this recollection altogether. But when I met J, it all shot back at me in a jolt. Not only did J look familiar upon our first meeting, but I was reminded of the past life recollection and knew, just knew that the missing husband was this guy, J.
J is a black-and-white science-minded all-around skeptic, agnostic, and for sure did not believe in past lives or anything of the sort. He thought I was crazy. But he also thought I was cute. So he rolled with the crazy and 5 years later, we married. In that time, though, he’s come to sincerely believe that the scenario I describe to him is real. Something about it, especially my description of him resonates with him. I can’t really tell you what it looks like from the outside, but I can describe the inside. It was two stories, an open center, so kind of like a cathedral ceiling in the middle, many giant columns, many juxtapositions of quadrilaterals and arches. Really beautiful. Aspects of the home décor were incredibly ornate and detailed. It wasn’t very bright, though. It was dimly lit. It was big. Huge. Looked like we were better off in that lifetime than we are now. Lots of rooms. Lots of… uh…help. Meaning, I don’t think I actually did any chores. And you, you my dear, were never home. You were some kind of a merchant, physically round and rotund like how you are now (“Gee, thanks,” he said flatly), and you liked bold, bright colors. Red, etc. I think you had a darker complexion than me and in some way we were from different backgrounds or something. There was something about you and ships. You were always on a ship or you had ships, I’m not sure. Definitely ships. … What’s a Moor? I want to say Moor… But point is you were never— home. Yet deep down I knew the answer. Some folks are innately gay, some are innately straight, some are innately polygamous, and others are monogamous. J’s soul is monogamous. When I finished and showed him, he didn’t say anything for a while and simply stared, and blinked. “That’s pretty detailed for something out of your head, with no reference,” he said. What was weird, though, is that in a way, I did have a reference. When I closed my eyes and tried to open myself up, I could see that image almost like a photograph. I could see the colors. Lots of red, oak browns, some very light blue, lots of white, a little bit cold, lots and lots of little holder-things for flames. I keep that sketch in my mementos box. Over time, J confessed to me that my description resonated with him. If in a crazy alternate reality such things as past lives existed, then my description of him wasn’t crazy. “I really can’t explain why I don’t think it’s crazy, but it’s not crazy,” he said. In this lifetime while we were dating, I didn’t always want to be with J. I was reluctant, but he chased me down. If I picked up and flew across the country, he picked up and flew across the country too. He supported my independence, my ambitions, my career, everything. He is always unconditionally supportive and, most of all, he is always there. He was the one to point out that maybe it’s karma. Maybe the reason I am now the one who is doing everything I want to do, pursuing all my dreams, and he’s always there with me to hold my hand is because he is atoning for something from our past life marriage. I’ve basically told you everything. That’s all of it. See, I’m actually not crazy. I’m a character of law and letters and so I never explored any of the above further. I never looked up anything, never did any research, never tried to confirm the historical accuracy of the sketches or my recollections, never even tried to reflect on what any of these imaginations could mean or why I’d “recall” them. Then recently I had a conversation with a kindred spirit, someone who is deeply intuitive and empathic. He is also a tarot practitioner and an enthusiast of the metaphysical arts. With normal people, a conversation about my crazy daydreamed past life would never come up, but it came up with him. He is a peripatetic and has traveled the world over on his spiritual path. We’ll call him Locke. I covered the broad points of my “recollections” as I’ve mentioned above, though he didn’t see any of those sketches. I just told Locke it was a two-story house, I can recall the interior with far greater clarity than I can the exterior, and wherever it was, it was beautiful. Just beautiful weather, beautiful landscape, beautiful place. “Was it the Netherlands?” he offered, completely at random. Inside, I thought, Netherlands? That is definitely not it. I know nothing about the Netherlands. Nothing. I’m a curious person, though. When I know nothing, I like to learn. Maybe it could have been the Netherlands. Who knows. I mean, I don’t even know anything about the Netherlands, how can I say no or yes with any conviction? So I decided to Google it. But what the heck does one Google? I sat there staring blankly at the computer screen for a minute. I feel so silly having to admit the keywords I searched for. I really didn’t know where to begin. So I had to go with the gut. Netherlands. He said Netherlands, fine, let’s see what the Netherlands was like in… 1700s…. where the hell did I get that? I don’t know. Worth a shot. … wealthy home. Doh. I’m a moron for Googling something like that. But it was the most blunt and direct way for me to describe the home I saw in my head. There it was. That’s it. That’s it. No, not that house exactly, but just like that. That was essentially give or take what the house in my crazy dream/daydream looked like. I clicked on the image. The photo was from the Wikipedia entry for Dutch Golden Age. And in the same way J, a non-believer who confessed that it all irrationally made sense when I told him about our so-called past life together, I, too, initially a non-believer on the Netherlands thing confess that the location (and time) reference irrationally makes sense now that I’ve seen this. When I spoke with Locke later, he said he too felt it was in the 1700s but in the rush of our initial dialogue, hadn’t mentioned it. How strange. Now I’m forced to ask myself why. And how, but more important to me, why. And why now? My first snapshot of any of this started in third grade. Why is the substance of it all coming together now, decades upon decades later? I was in a restaurant many years ago with an enchanting young lady. New Zealand in those days was “meat-and-two-veg” and anyone wanting wine with a meal had to go to an especially licensed (by the government) restaurant (always pretentious rather than sophisticated—and costly). But good food was available in unsophisticated restaurants and NZ was just beginning to enter the 20th century (late sixties, I think). Anyway, I remember absolutely vividly having the specialty of the house (steak~!) with tarragon sauce. But that is exactly what I mean! These flashes. How do you rationally explain the flashes? Why have such flashes and is there any significance to the timing of such flashes? An atheist who doesn’t outrightly dismiss reincarnation? Interesting. That I think all formal religions are rip-offs established to garner wealth and power for the privileged doesn’t mean that I have a closed mind. Atheists too can be seekers. A one-hundred percent rationalist may explain such flashes as releases of hallucinogenic chemicals in the brain. They could even be right — but what triggers those releases? To a rationalist both telepathy and precognition are impossible. But I’ve done both, and for myself I’m a reliable witness—it’s hard to gainsay something you’ve actually experienced, regardless of ‘expert’ opinion. Sadly I cannot do it at will, and it hasn’t happened for a while. I’ve posted (satirically), if you like I can look up and give you a reference (I don’t want to ‘advertise’ on your blog without permission). Atheists, like evangelicals, have a little too much conviction for my general comfort. But that’s just me being biased. Since I am not sure, I feel contempt for those who are. Kidding. Hubby considers himself an agnostic. He leans toward atheism, but acknowledges he just isn’t sure, so he calls himself agnostic. Actually, he believes in aliens, but that is an entirely different story. Oh advertise away! I have no contentions with links to informative content! I have zero telepathic abilities. I do have halfway-reliable gut-intelligence though.